When you invest a little of your time in taking care of your door, you make it possible for all components to live up to their predicted lifespans. If you don’t know where your garage door manual is, go to the manufacturer’s website and download a copy. You’ll find all the necessary information in it: how to clean and paint the door, safety instructions, what issues you may tackle on your own and what needs to be handled by a professional. The same goes for the door opener manual: it tells you which tasks to perform and how, how to program the unit or make adjustments when necessary, and finally, what to do when something’s off. 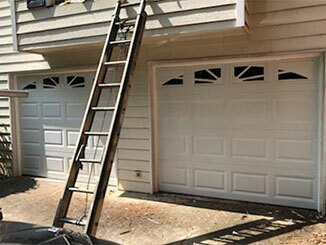 No matter the make or model of your door, a visual inspection is a must! Get inside the garage and see whether there are any gaps letting light in - if that’s the case, know that your door is not properly aligned. Make sure the tracks run parallel to one another and clean them from debris, if any; and inspect the rollers for wear and tear. Go through each bolt, screw and hinge and ensure everything is in its correct place and well tightened. Cables should be tight, without any frayed or broken strands. Examine springs for rust and visible gaps and finally, check the tension of the opener’s chain or belt. The weather seal can dry and crack over time and lose its ability to insulate the garage and keep out rodents and insects. If your weather stripping is in bad shape, remove it with a pry bar or a screwdriver and scrape off dirt and corrosion. Then, install a new one with roofing nails or wide head box nails. If you suspect a problem concerning your cables or springs or you have a problem not covered in your manual, feel free to contact our team of professionals now for service you can count on.